If you’re looking for a short SUP road trip just one hour’s drive from Perth you MUST put Lake Clifton on your list! This is road trip #1 and the plan is to get know our gorgeous South West a little more intimately. I’ve now become a tourist in my own back yard and I’m hooked!! The town of Lake Clifton is situated about half way between Mandurah and Bunbury and has a population of just over 400 people. The amount of water in the region is surprising considering it’s not obvious from ground level but looking at it on a map puts it into perspective. The Peel-Harvey Inlet and surrounding lakes is a huge body of water. 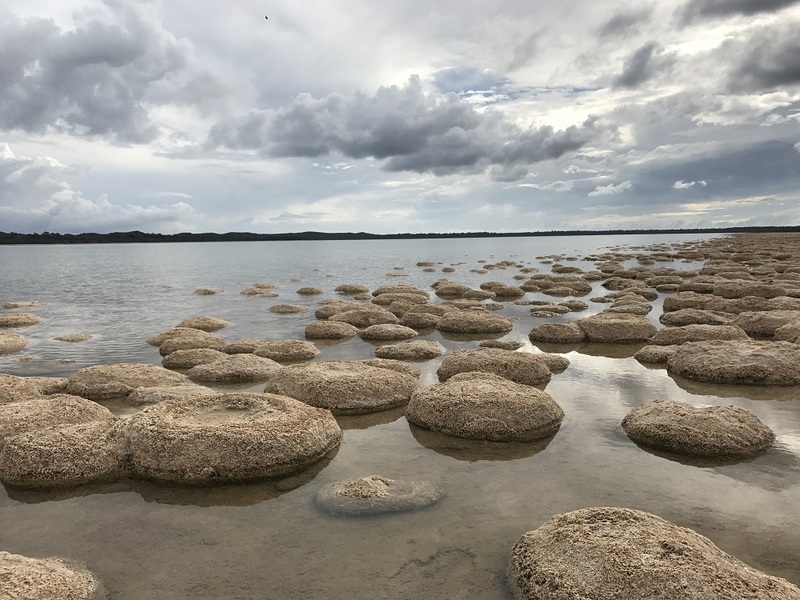 Lake Clifton itself is home to the Thrombolites. I had never heard of them until a week before I planned this trip and to my surprise nor had many other people that I spoke to. Anyway as usual curiosity got the better of me so I thought I’d check them out – I was mesmerised! I’m surprised that it’s a fairly low key attraction but I’m also glad that this precious prehistoric site is not over run with crowds of people. It makes it all the more special. As far as I am aware paddling is not permitted and it was absolute torture not being able to drop in here (but for good reason). These dome shaped living fossils are the earliest forms of life on our planet and there is something majestic about them that draws you in. I could have spent a lot more time here contemplating their existence and like the forbidden fruit in the garden of Eden, resisting the temptation to drop the board in was difficult indeed. After that experience I was wondering if I could find somewhere to paddle that would be even remotely inspiring and I wasn’t disappointed. With the company of some friends the next stop was Island Point Reserve not too far from the Thrombolites and sits within the Peel-Harvey Inlet. This was also a magical place and a photographers delight. At first we weren’t sure where to paddle to as it was like a huge shallow pool with not a lot of contrasting landscape but as we set out we immediately had the company of skates and stingrays – heaps of them, fish were jumping and as the sun set the hue on the water was incredible. We were in our own worlds, yoga, taking photos, bird watching, it was a Zen experience and none of us wanted to leave. There are basic facilities and BBQ’s so you could have a picnic or BBQ and totally relax. For an overnight stay the Lake Clifton Tavern offers budget motel style accommodation and provides great pub food (I’ve heard the food is awesome), cold beer and pool tables. I love the well preserved 1970’s retro building and the owner Dean is a true local who can tell you all you need to know about where to paddle and if you happen to own a light aircraft or helicopter there is even a landing strip 100 meters from the tavern! It’d be a great vibe with a group of people and if you like to have a few it’s a short stagger to the motel room. I guess it’s one of these places that will either captivate you or not but do yourself a favour and make up your own mind and don’t forget your camera, It’s a photographers paradise.